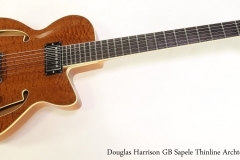 The Douglas Harrison GB model has become a standard single cutaway, carved top chambered body thinline guitar intended for jazz guitarists. This model was designed in collaboration with the late Toronto jazz player Gary Benson to meet the needs of a working player. Here we’re looking at a lightly used Harrison GB built during 2013. 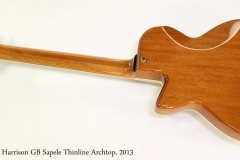 It features a lovely quilted Sapele top, Tropical Mahogany for the body and neck, with Ebony for the headplate, tailpiece, bridge and boudn fingerboard. The Harrison headstock logo is Mother of Pearl. The tuners are the excellent Gotoh 510 model, and the pickup is a Seymour Duncan Jazz wired with a push/pull pot to provide serial or parallel coil configuration. The construction, workmanship and finish are top notch. 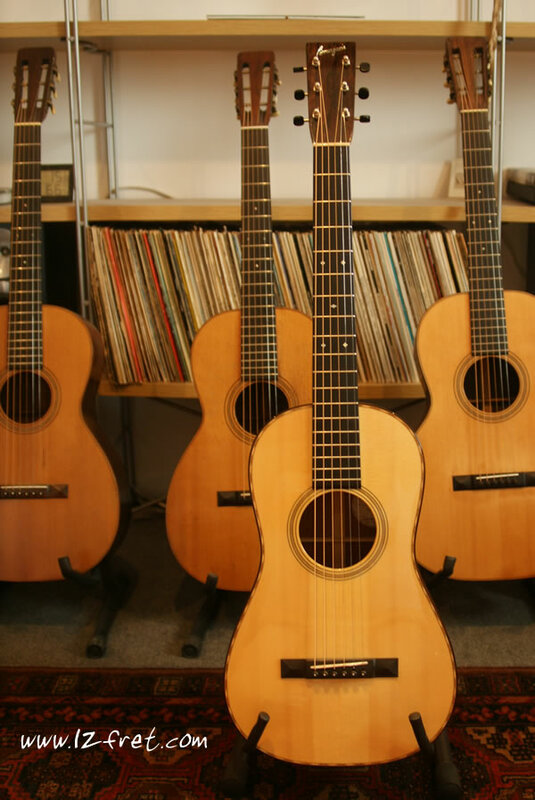 This guitar is in very clean shape with absolutely minimal wear. A hard shell case is included.